Tip: There are two methods to identify available cities in Building Maker. 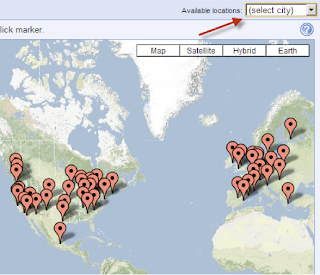 You can either click on a placemark icon, or use the "Available locations" drop down in the upper-right corner. If you're not familiar with Building Maker, it's a new 3D modeling tool for adding buildings to Google Earth. It's fun to use, and an easy way to get on the 3D map. Oh, and be forewarned, it can be addictive!